Netwrix Auditor for Windows Server delivers complete visibility into what’s going on in your Windows server environment. 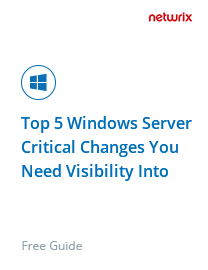 To keep your Windows servers secure and prove IT compliance, regularly compare your server configurations to a known good baseline and monitor all changes made to them. 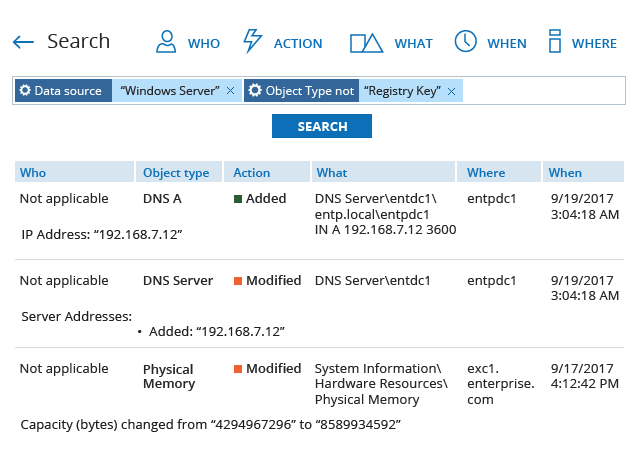 Enables you to quickly sort through Windows Server audit data and fine-tune your search criteria until you find the information you need. Save your searches as custom reports and have them delivered to you on schedule. Slashes preparation time for compliance audits with predefined reports mapped to PCI DSS, HIPAA, GDPR, SOX, GLBA, FISMA/NIST, CJIS and other regulatory standards. Provides insightful and easy-to-read reports on all changes to your local audit policies, so you can ensure that no modifications are made without explicit management approval. To safeguard your environment, it is critical to know every nook and cranny of your Windows servers. What DNS records were updated recently? Who changed access permissions to your files shares? Is your server configuration in line with your security policy? What software was installed while you were away? Netwrix Auditor gives you detailed answers. Use Netwrix Auditor to perform systematic Windows Server auditing and quickly note any deviations from your known good server configuration baseline, such as outdated antivirus or harmful software. Remediate IT risks in accordance with server management best practices. Windows Server security audit logs are so noisy and cryptic that you are likely to miss critical events, such as registry key modifications or USB insertions. 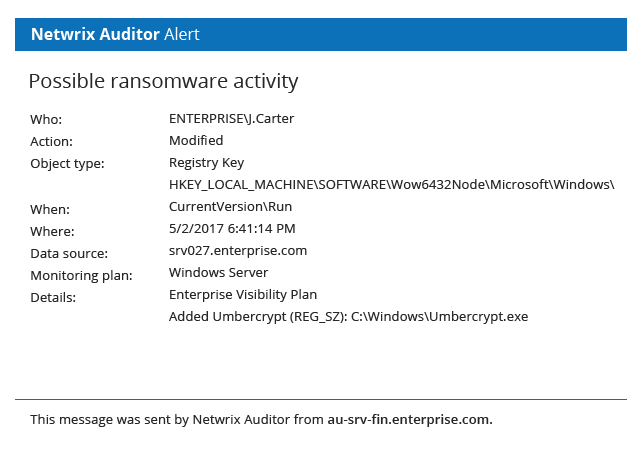 The Windows audit software from Netwrix can alert you to these events and other harmful behavior patterns, so you can respond in time to avoid security breaches. 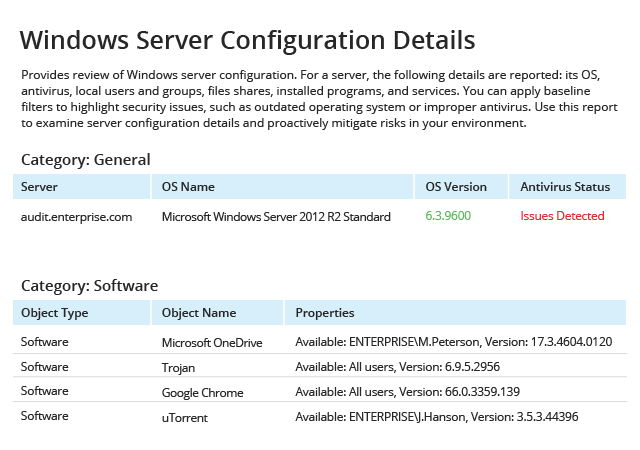 Any changes to file share permissions or the Local Administrators group can threaten data security on a Windows server. Investigating incidents using Windows audit logs is difficult or even impossible, as you have to navigate endless pages of native audit logs and struggle to make sense of cryptic events in machine-readable format. Netwrix Auditor enables you to quickly analyze potential privilege abuse incidents and bring rogue insiders into the light. Native Windows Server audit logs generally hold only a week’s worth of audit records, and contain low-level information that makes it hard to perform proper troubleshooting. Netwrix Auditor prevents the loss of audit data and provides all the necessary details, including the before and after values for each modification, in an easy-to-read format, so you can get right to the bottom of an issue and remediate it in time. Learn more about how Netwrix Auditor for Windows Server enables you to gain control over critical applications and ensure system security. 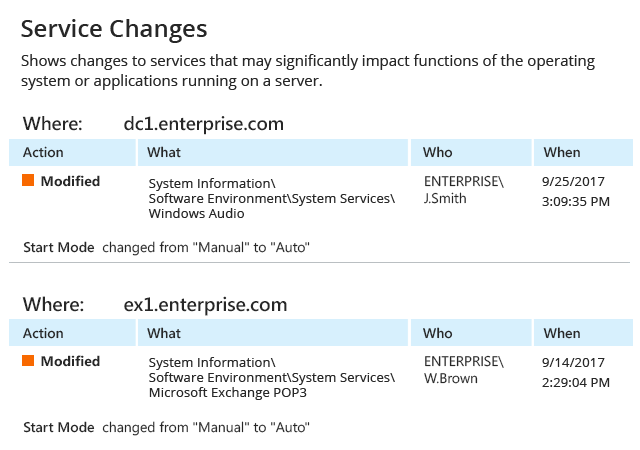 Keep tabs on the top 5 critical changes in your Windows Server environment using security intelligence from Netwrix Auditor. WUSD uses Netwrix Auditor to comply with state regulations and reduce the time required for annual audit preparation. GVEC tightens security with a single-pane view across all systems, including Windows Server, delivered by Netwrix Auditor. Netwrix Auditor empowers Washington County to protect PII and ensure compliance with multiple state standards. Using Netwrix Auditor, Medical Center Clinic automates its monitoring process, slashing the workload in half. "Instead of hopping around 130 different servers, looking at logs and trying to figure out who made what change that caused an issue, I receive the answer right away in Netwrix Auditor. The product saves me at least six hours per week. That is priceless." In addition to auditing and reporting on Windows Server changes, IT pros also need comprehensive Windows file server auditing — you need to know who read, modified, deleted or created files in a shared area. Netwrix Auditor for Windows File Servers exceeds the capabilities of native tools and saves you tons of time you used to spend browsing through security event logs. To keep you abreast of what’s going on across your file servers, the solution delivers reports on who changed what, and when and where each change was made, for all files, folders, shares and permissions. Its insightful file access auditing enables you to chase down suspicious activity before a breach occurs. To top it off, the solution also automates setting up native audit policies on your data storages to audit files and folders. Netwrix Auditor for Windows Server is a dedicated auditing application that offers IT auditing and the reporting of Windows Server changes and provides capabilities for auditing Windows event logs and syslog data. Monitoring event log with Netwrix allows for the automated detection of critical events and centralized log management, such as events consolidation and archiving, alerting and reporting. This maximizes visibility of everything that is happening in the IT infrastructure and networks. It helps organizations improve their security posture, streamline compliance efforts and optimize routine operations. 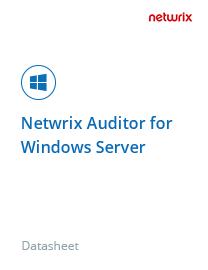 Netwrix Auditor for Windows Server helps organizations to enable user network activity monitoring and establish full control over any critical systems and applications, including those that do not produce logs or do not natively provide enough insight into user activity. Keeping an eye on what privileged users are doing with the Netwrix video recording feature allows organizations to reduce the risk of harsh system downtime and data exposure. Netwrix technology ensures that the video recordings are easy to navigate through and replay. The auditing of users’ logon and logoff events to servers is one of the key elements of computer activity monitoring. Netwrix event log management offers predefined reports, such as users successful and failed logons, to promote a highly secure environment. Netwrix Auditor for Windows Server enables organizations in any industry to improve their security posture. The solution includes alerting on critical configuration changes and facilitates efficient event log management. On top of that, its Windows Server monitoring enriches the capabilities of native tools to enable full control over log monitoring and more comprehensive network and performance monitoring. Netwrix Auditor for Windows Server delivers efficient IT auditing and reporting on Windows Server changes and enables you to stay on top of Windows event log and syslog data. The application facilitates Windows Server event log monitoring with automated detection of critical events and centralized log management, including event consolidation, archiving, alerting and reporting. By maximizing visibility into what’s happening in your IT infrastructure and networks, Netwrix Auditor for Windows Server helps your organization improve its security posture, streamline compliance efforts and optimize routine operations. Users can accidentally infect corporate Windows machines with viruses and malware from their home PCs by simply plugging in a flash drive. They can also use these portable storage devices to extract sensitive information from the organization’s file servers. Netwrix Auditor facilitates data leak prevention and reduces the risk of malware infection in critical systems by improving the detection of both USB devices insertions and attempts to enable use of flash drives via Group Policy.